We want to see what you’ve got! Unleash your creativity by participating in the Artissue Design Contest today! Just download the design template from bit.ly/7-Select-MY2017, design and send it in to us at contest@7Eleven.com.my. Don’t forget to include your details along with the subject title – 7-Select-MY2017. Find out more at 7-Eleven Malaysia. 1. The “7-Select Artissue Design Contest“ contest (“The Contest”) is organized by 7-Eleven Malaysia (“The Organizer”) and shall be held from 4th April 2017 to 8th May 2017 (“Contest Period”). 2. The Organizer may at its sole and absolute discretion extend the Contest Period at any time without any prior notice. Unless an Extended Period is announced, any entries received after last day of the contest period (due to any reason howsoever and/or whatsoever arising) shall be disqualified. Any participation in the Contest during the Extended Period (if any) shall be governed by these terms and conditions (“Terms and Conditions”), which shall remain in full force and effect. 3. The Contestants must be citizens or permanent residents of Malaysia and above the age of eighteen (18) years with a valid National Registration Identification Card (NRIC) number (12-digit) at the time of participation of the Contest. 4. If Contestants are under the age of eighteen (18) years, ensure that parents have consented to the Contestants entry into the Contest and these terms and conditions. b. Representatives and/or agents (including advertising agents and contest management agents) of the Organizer, including but not exclusive to their respective immediate family members, meaning parents, spouses, children and siblings. 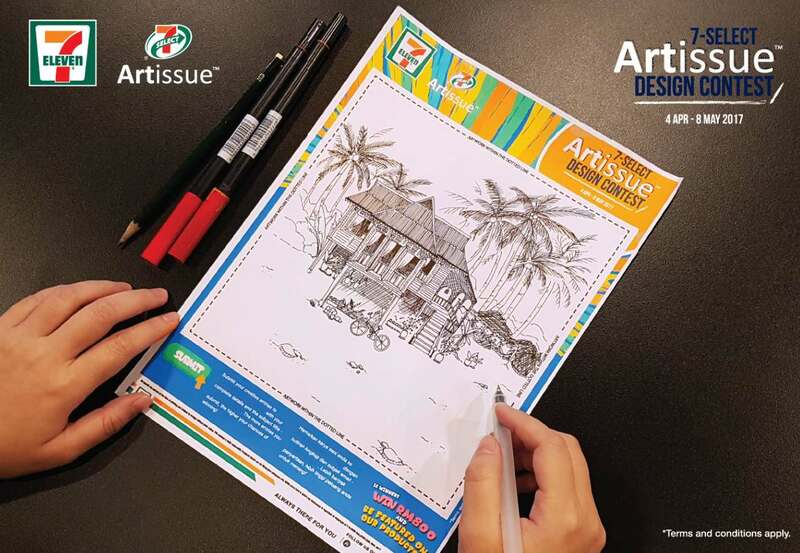 Step 1: A Qualified Participant must download the “7-Select Artissue Design Contest” design template from 7-Eleven Malaysia Facebook page or bit.ly/7-Select-MY2017. Step 2: Be creative and design the “7-Select Artissue Design Contest” design template. Step 3: Submit creative entries to contest@7eleven.com.my with complete details and the subject title “7-Select-MY2017”. Participants are allowed to submit as many entries as they like during the contest period. Each design entry has to be submitted in JPEG format with file size lesser than 5MB. 6.1 The Organizer takes no responsibility or assumes no liability for the comment and/or content that the participants may post. Participants are solely responsible for consequences of posting and publishing their comments and/or contents. 6.2 The Organizer may, in its sole discretion, disqualify any entry which the Organizer considers to have made been in breach of these terms and conditions. This includes, but not limited to, failure to meet Contest eligibility criteria or entry that contains obscene, libelous, racially disparaging, defamatory, harassing or threatening or unlawful content. 6.3 The Organizer will not be responsible for entries for the Contest that cannot be processed due to technical or operational reasons. Entries that are lost, misdirected, incorrect, incomplete or illegible, for any reason whatsoever, will be disqualified. 6.4 A panel of judges consisting of representatives of the Organizer will select 12 winners. The decision of the panel of judges will be final and no correspondence will be entertained. 7.0 A total of twelve (12) lucky winners will be selected during the Contest Period. Each Qualified Participant is entitled to one (1) prize of RM800 cash prize only during the Contest Period. Winners’ names will be displayed on our 7-Select Artissue. 7.1 Entries must be submitted within the respective qualifying date. Otherwise, the entry will be disqualified. The Organizer may at its sole discretion amend, change or extend the qualifying dates for any of the qualifying weeks. 7.2 The Prizes must be collected in person at the Organizer’s office at Level 1, Podium Block, Plaza Berjaya, No. 12, Jalan Imbi, 55100 Kuala Lumpur, unless advised otherwise, no later than three (3) weeks after winner announcement has been made. Identification includes NRIC, or passport, which displays the full name. 7.3 Only contestants who fulfill the Contest Mechanism stated above shall be eligible to win the Prize. Incomplete entries and/or Participants that fail to fulfill the Contest mechanism will automatically be disqualified from the Contest without notice. 7.4 The Organizer reserves the right to substitute any of the Prizes with that of similar value at any time at their absolute discretion without prior notice and all Prizes are non-transferable to another individual and absolutely non-negotiable. 7.5 In the event, for any reason whatsoever, any of the Winners is unable to collect the winning prize within the stipulated time period, the Organizer shall not reimburse or compensate the Winner. The Organizer shall not be obliged to give extension notice of the Prize Collection Period. All unclaimed Prizes after the Collection Period will be forfeited. 7.6 All Prizes are given on an “As Is” basis and are not exchangeable, transferable or redeemable for cash, credit, other items or voucher, in part or in full. 7.7 The Organizer makes no warranties or representations whatsoever with respect to the Prizes and shall not be responsible nor liable for any problems and/or damage thereto or arising there from. 7.8 All Winners’ will be notified by e-mail to his/her e-mail address within one (1) week from the time the winner announcement is made. In the event that the Winner does not receive any notification from the Organizer during the stipulated time period, the Winner is required to contact the Organizer via Facebook Direct Message within one (1) week from the Contest’s closing date; failing which, the Prize will be forfeited. The Organizer reserves the right to use any other method or medium it deems fit at its sole and absolute discretion for the purpose of announcing the Winners. 7.9 The Organizer will not be held liable in the event the Winners cannot be contacted for whatever reasons after at least three (3) attempts and/or days. 7.10 The Organizer reserves the rights to appoint a third party to conduct the verification of Winners and to fulfill the delivery of prizes. Winners are to agree that the Organizer may provide all necessary information of Winners to such third party to facilitate such service. 7.11 The judges’ decisions are final and no correspondence thereon will be entertained. 7.12 Prizes must be claimed in person. Identification, which includes NRIC, or passport that displays a photograph of the Winner will be required. In the event of the Organizer is requested to post/courier a Prize to a Winner, the Organizer will not be held liable of non-receipt of Prize or damages caused during the delivery process. No replacement and/or exchange of Prize will be entertained. 7.13 The Organizer reserves the rights to forfeit Prize of any Winner who does not provide the required details as stipulated in the Contest Terms and Conditions. 7.14 Under special circumstances and subject to the absolute discretion of the Organizer, a Winner may nominate a designated representative to collect the Prize. The representative will be required to present a written authorization from the Winner and photocopy of Winner’s NRIC (front & back). 7.15 All Prizes are accepted entirely at the risk of the Winner, and the Organizer excludes all warranties in connection with any Prize to the extent permitted by law. 7.16 In the event that a Winner chooses not to accept a Prize, they forfeit any and all claims to that Prize, which will be dealt with according to the absolute discretion of the Organizer. 7.17 In the event the Organizer has a prize giving ceremony, the Winners are required to attend at his/her own cost and expense to collect the Prize. In the event the Winner is not able to attend the prize giving ceremony, the Winner must nominate a representative to be present at the prize giving ceremony to accept the prize on his/her behalf otherwise the Organizer shall re-select the winners. 8.0 Contestants and Winners shall assume full liability and responsibility in case of any liability, mishap, injury, damage, claim or accidents [including death] resulting from their participation in the Contest, redemption and/or utilization of the prizes and agree to release and hold the Organizer and its Prize partners free and harmless of any liability. 8.1 All transportation, accommodation, personal costs and/or any other costs, fees and/or related expenses that are incurred to participate in the Contest and to redeem the Prize is the sole responsibility of the Contestant(s) and/or Winner(s). 8.2 The Organizer shall reserve the rights to use the names and/or photographs of the Contestants as materials for the purposes of advertising, trade and/or publicity, without any prior notice to the Contestants. The Contestants shall not be entitled to claim ownership or other forms of compensation on the materials. 8.3 By participating in the Contest, Contestants hereby give their consent to and authorize the Organizer to disclose their particulars to third party service providers and/or partners engaged by the Organizer for purposes of the Contest and/or any customer survey in understanding Contestants’ purchasing behavior. 8.4 The Organizer’s decision on all matters relating to the Contest shall be final and binding and no further correspondence or attempt to dispute such decision would be entertained. 8.5 The Organizer reserves the absolute rights to change, amend, delete or add to the Contest Terms and Conditions without prior notice at any time. 8.6 By participating in this Contest, Contestants agree to be bound by the Terms and Conditions of the Contest and the decision of the Organizer. 8.7 An individual who participates in the Contest may be required to submit personal or confidential information about himself or herself (including without limitation his or her name, address, telephone number, e-mail address, marital status, occupation, spending preferences or any other such information) (“Personal Information”) to the Organizer. The Organizer will treat any Personal Information obtained from an individual who participate the Contest in accordance with the Legislation on the Protection of Personal Data Policy. 8.8 This contest is organized by 7-Eleven Malaysia and Facebook is released by each entrant and participant of the said Contest. 8.9 By joining this contest, you also acknowledge that the promotion is in no way sponsored, endorsed or administered by, or associated with Facebook. 9.0 All submission materials and artwork submitted to 7-Eleven Malaysia in accordance with these Terms and Conditions must be the original works produced by the participants. The participants must also be the owners of the physical, copyright and intellectual property of all the submitted materials and artwork. 9.1 All winning artwork including the documents and materials submitted/Artwork to 7-Eleven Malaysia shall be the sole property of 7-Eleven Malaysia. 7-Eleven Malaysia reserves the right to retain all winning artworks and any supporting documentation. Participants are advised to photograph their submissions for their own records prior to submission. 9.2 All winners shall grant 7-Eleven Malaysia, royalty-free, exclusive license to exhibit, archive and reproduce images of their winning artwork including, but not limited to brochures, calendars, catalogues, post cards and websites or any kind of medium which in the opinion of 7-Eleven Malaysia is fit for promoting the Competition or marketing purposes. 9.3 Each participant undertakes to indemnify and hold 7-Eleven Malaysia and its officers and agents harmless from and against any and all liability, loss, damage, costs and expenses in relation to any claim or action brought against 7-Eleven Malaysia or its officers and agents arising out of a breach of this warranty by the participant. For more information or enquiries, please contact us via Facebook Direct Message, 7-Eleven Malaysia Facebook page on Mondays to Fridays, 9:00am to 6:00pm.